32 When Elisha reached the [Shunammite] woman’s house, there was the boy lying dead on his couch. 33 He went in, shut the door on the two of them and prayed to the Lord. 34 Then he got on the bed and lay upon the boy, mouth to mouth, eyes to eyes, hands to hands. As he stretched himself out upon him, the boy’s body grew warm. Unspecified in Bible. I have set the time of day as late morning. Note: I believe this scene takes place the day after scenes 01-11 – see below for my reasoning. The sun is overhead, casting shadows below people & objects. Light is streaming in through the high, narrow window, similar to a previous scene (2 Kings 04 – Shunammite’s son resurrected – Scene 06 – Son dies), even though this is a different day. 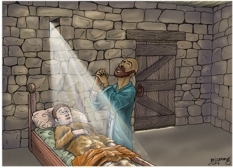 The Shunammite woman’s son is lying on Elisha’s bed in the upper room, whilst Elisha is fervently praying by the bedside. 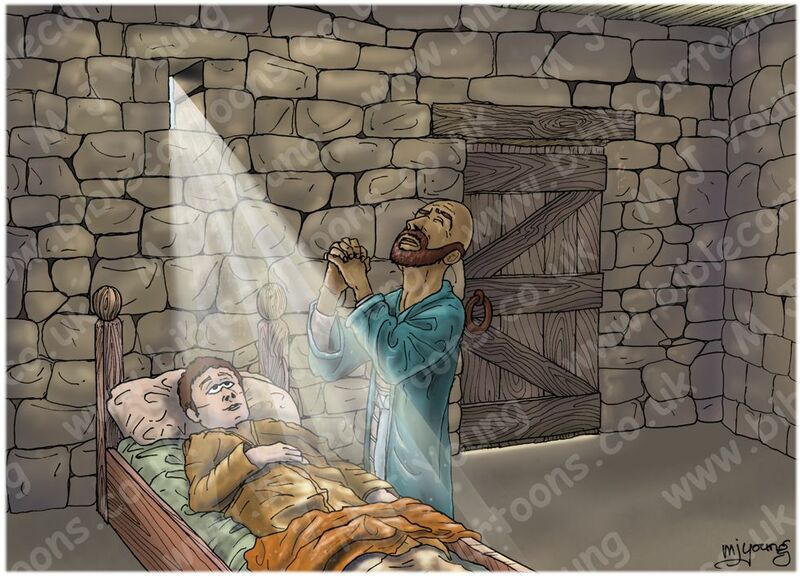 In this scene we see the Lord is answering Elisha’s prayers & is bringing the Shunammite’s son back to life. The boy’s eyes are gradually opening & he has lost the deathly pale skin colour I drew in scene 06! I decided to use the same background (walls, window, lighting) from scene 06, for this scene, with changes to the boy, the addition of Elisha, & showing the closed door, mentioned in verse 33. As in scene 06, I enjoyed drawing the dust motes & sun’s rays coming in through the door & window. Windows in ancient buildings were often small, allowing only a little light in, & providing ventilation. The use of small windows was a method of excluding thieves! 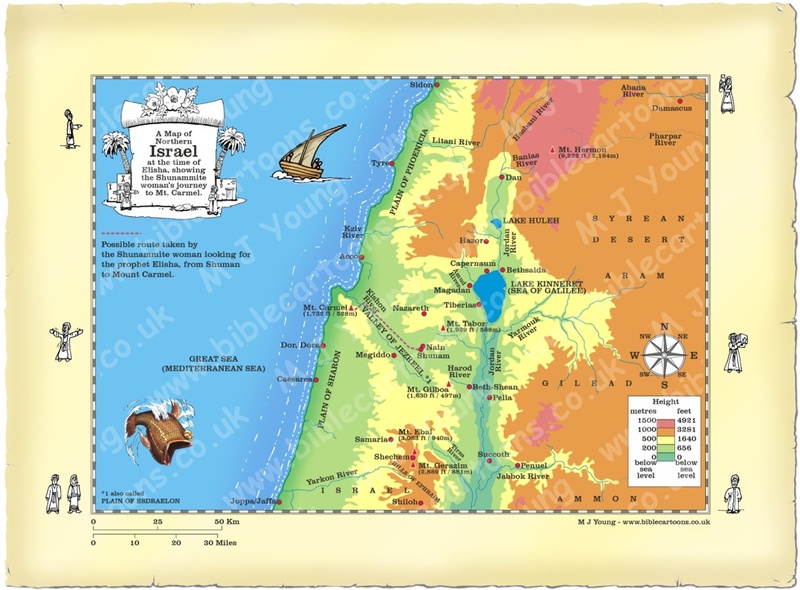 Bearing in mind that the Shunammite woman was riding a donkey led by a servant, & that she had to travel about 18.5 miles (30 km) from Shunam to Mount Carmel, I wonder if she would have managed it in a single day. That distance is a direct “as the crow flies” line, so the actual distance could have been 20 miles or more. For this reason I propose that scenes 12 to 14 happened on the day after scenes 01-11.